Breakfast is said to be the most important meal of the day and nowhere is that fact more appreciated than at the Wolseley restaurant in London's Piccadilly. The brainchild of Jeremy King and Chris Corbin - celebrated restaurateurs and founders of three of London's most iconic dining destinations: The Ivy, The Caprice and J Sheekey - the Wolseley is a cross between the traditional robustness of the Parisian brasserie and the gloriously grand but cosy comfort of the Viennese cafe. Breakfast is an institution at the Wolseley and whether you want a healthy breakfast of fruit, cereal and yoghurt, or a full no-fuss English, every need is catered for using the finest ingredients from the best of British and European producers. "Breakfast at the Wolseley" serves up the ultimate guide to producing and enjoying a superb breakfast in the Wolseley style. There is a host of delicious recipes, whether it's fresh fruit and crisp croissants or a full English with steaming high-grade Arabica blend coffee. 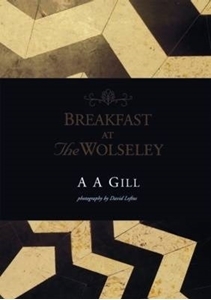 You can also learn more about the background and ethos of the Wolseley with a description of the building and how it became the icon it is today, including an intriguing look at how breakfast service is run at the Wolseley both at front of house and behind the scenes.